Two Crude Dudes - FLYING TIGER ENTERTAINMENT, INC. 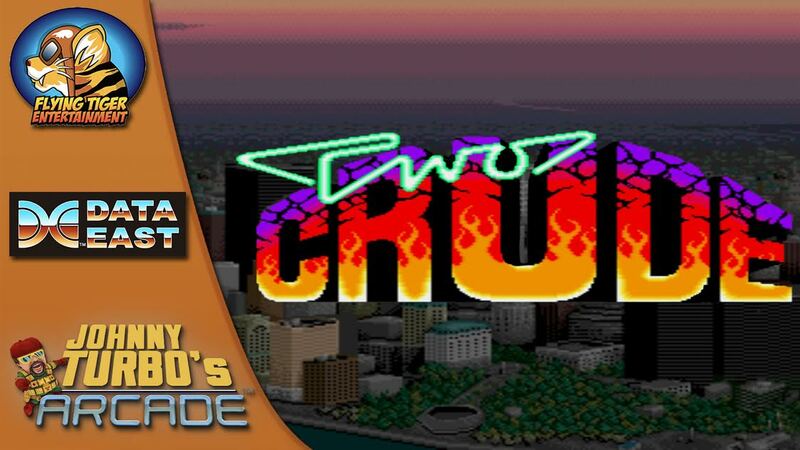 Flying Tiger’s Johnny Turbo’s arcade releases the 1990’s arcade classic, Two Crude for Nintendo Switch™! This will be the 6th game to feature Local Co-op Play! On the go, or in your home. Los Angeles, CA - June 28th, 2018 – Flying Tiger Entertainment presents the Japanese arcade hit, Two Crude, the seventh action game release from Johnny Turbo’s Arcade, featuring classics by Data East™. Launching on July 5th, 2018 for $7.99 in America, Pre-Order on June 28th, 2018 for $6.99. Coming soon in selected European territories. Two Crude is the sequel to the original hit 90’s Beat ‘Em Up arcade game, Bad Dudes. With 2-player simultaneous co-op action, Two Crude dudes are on a mission to save their city. The year is 2020. The once grand New York City has been leveled by a series of nuclear explosions. Now declared a “Nuclear Zone,” no one can enter and no one can leave. The city is near total destruction. High atop the wasting skyline, one skyscraper remains. Inside, a diabolical mad scientist has begun genetically modifying the masses, turning them into mutant killing machines. Loaded up with advanced weapons, their goal is to take control of the ruined metropolis, crushing anyone who stands in their way. The government’s last hope is with Two Crude dudes. 2x the fun! 2 players Co-op! With The Real Arcade Feel! Two Crude: Brawl humans, mutants and cyborgs to regain control of the Big Apple before the city is destroyed forever.